Sometimes a Court Card can just stump us – and our client. No matter what we say about the energies of the character in the card, the client can’t relate it to either herself or anyone that they know. When that happens, I use an Oracle card to help point me in the right direction. You can read more about this idea here and here. Today’s card combination really does what it says on the tin – which might make interpretations more tricky! 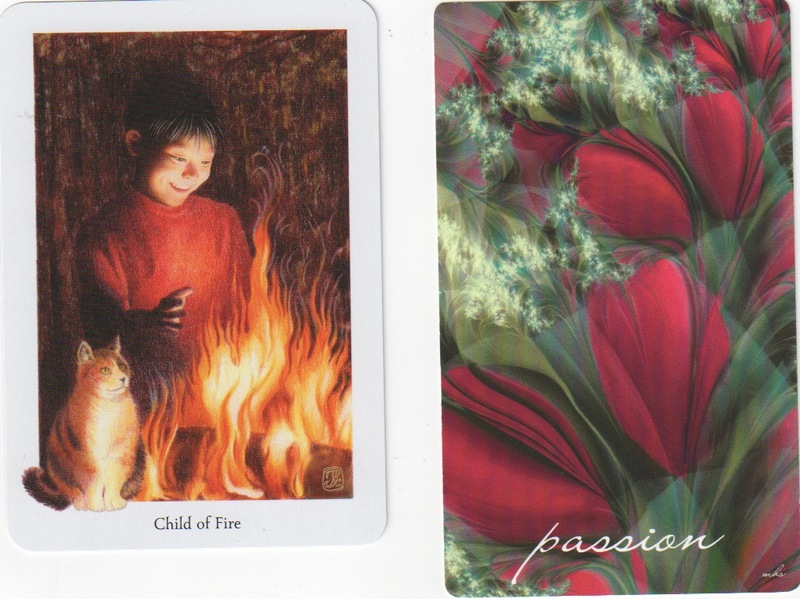 We have the delightful Child of Fire (equating to the Page of Wands) from the gorgeous Gaian Tarot by Joanna Colbert-Powell and the amplifier card is Passion, from Mindy Somers’ Dreaming in Colour Lumen deck. The Child of Fire finds joy in the dancing flames before him and he reaches out his hand – to touch it? To just feel the heat a little more? This card reminds me of an anecdote told by Aleister Crowley (he of the ‘wickedest man in the world’ fame. The world had clearly never met Simon Cowell). When he was a youngster, Crowley was out walking with his father. The duo encountered a huge patch of nettles. His father told him to keep away from the stinging weeds, but young Aleister didn’t want to listen to the warning, he wanted to EXPERIENCE it for himself – so he ignored his dad and got stung to blazes for his troubles! The Page is alllll about experiencing new things and finding delight in that experience. But what if your sitter doesn’t recognise this person, these traits? The card pulled at random as the Amplifier is Passion. Red tulip-like blooms blossom over the card – what does this add to our understanding of the Child of Fire? What does ‘passion’ mean to you? How does it affect the Child of Fire? I’d love to hear your thoughts on this card combo! I like this idea of combining an oracle card like this. I often use it at the end of a reading, but I've never thought of doing it to help with a tricky card (often a court card). Thanks for this! It can require a leap of faith because it really narrows things down and you just have to trust in the process – like so much of card work lol! Tell me what the connection is between the blog title and Bolan, I'd love to know! Yep, the Passion card seems like it would help focus the energy of the Child of Fire onto talk of the querent's passion in life, identifying it for the first time, perhaps? Being influenced by a childhood passion? Childhood is often a good place to look if one is trying to figure out something they'd be really excited to be involved in. I like that idea of being influenced by a childhood passion very much, Joanne!